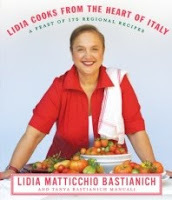 LIDIA COOKS FROM THE HEAT OF ITALY: A FEAST OF 175 REGIONAL RECIPES by Lidia Matticchio Bastianich and Tanya Bastianich Manuali has to be one of the most beautiful cookbooks that I've ever seen! It certainly isn't my typical cookbook because the recipes aren't easy or low-fat, but I have had so much fun reading through it. I swear it's almost a book that you could set out on your coffee table. I have to say that I was expecting a nice cookbook from Lidia (I've seen some of her older ones and they are all wonderful), but I had absolutely no idea how gorgeous this book would be. As some of you know, I have been dying to go to Italy for years now (and will some day I'm sure of it!) In the meantime, I can live vicariously through this cookbook. It really is as much of a travel guide to Italy as a cookbook. The cookbook is divided into sections by the different regional areas in Italy. In each section, there are beautiful pictures of the people, the land, and of course, the food. I absolutely loved learning about these different areas in Italy as well as what recipes came from them. I admit that I was a little intimated by some of the recipes because of the ingredients and/or the effort involved; however, I did try two of them! Both were absolutely delicious! The first one I made was the very simple Marinara Sauce. I guess the secret is in buying canned San Marzano tomatoes -- who knew? Anyway, the sauce took about five minutes to prepare and then it just simmered. It was a big hit with both me and my husband (the kids didn't want sauce on their pasta!) I will be making this recipe over and over again! Then, I decided to make a more traditional recipe from Calabria called Shepherd's Rigatoni. The history behind this recipe is that the shepherds in remote pastures would make it with the few ingredients they had available to them. Basically, it's pasta, sweet Italian sausage, some ricotta and Parmigiano-Reggiano cheeses, and fresh basil. It was beyond simple to make and I absolutely loved it! 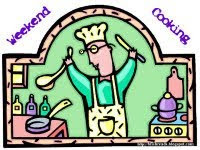 Needless to say, Lidia offers just loads of wonderful Italian recipes from soups to sauces, to main dishes to desserts. In addition, her daughter gives the readers the background information on the various Italian regions and the local people. It truly is a beautiful book from a very talented (and very knowledgeable) mother-daughter team. If you are interested in learning more about the cuisine of Italy or even if you just want to look at a beautiful book about Italy, then I highly recommend LIDIA COOKS FROM THE HEART OF ITALY! I'll have to try those two recipes. I love all kinds of Italian food, and this book does have it all. We love the American version of Italian foods, and both of the recipes you mentioned sound delicous! This sounds great. I love using ricotta in cooking too. I don't know why it isn't used more. Well, I for one, sort of keep "forgetting" it. But it really is great for recipes and much healthier than some alternatives! I know that I have no Italian in my family, but in my heart that just seems wrong. Cooking Italian food makes me feel all warm inside. I am totally going to order this cookbook from the library! I'm with you, Julie ... not all that adventurous beyond pasta for Italian cooking. I'd eat some of those other dishes if they were served to me, but I'm not ready to prepare rabbit in my own kitchen! I love Lidia! I used to watch her show on the weekends all the time, although I can't say I've ever tried any of her recipes. I'll have to check this out!